Who Is This ‘Squirrel Girl’ That Anna Kendrick and Shannon Purser Want to Play? Squirrel Girl and her competing suitors. Bizarrely, Squirrel Girl has become something of a trending topic in Hollywood circles these days. The obscure Marvel Comics superhero first popped up in mainstream media in early July, when the prolific Anna Kendrick told Net-A-Porter that she’d like to play her. A few weeks later, Shannon Purser — the breakout redhead behind Stranger Things’ best character, Barb — tweeted that she, too, was interested in portraying the character. Last week, Edgar Wright endorsed Kendrick’s ambition, garnering thousands of likes and retweets. If you’re not deep in the weeds of comics fandom, all of this stuff must have been truly baffling. So we’re here to answer the questions: Who on earth is Squirrel Girl, and what’s her deal? Okay, so, what’s her deal? In brief: She’s Doreen Green, a quirky crime fighter with squirrel-based superpowers, a lady with a sunny disposition, and a college student studying computer science. She eats nuts and kicks butts. She has … squirrel-based … superpowers? What does that even mean? Fair enough! I hadn’t heard of her before these actors started talking about her — is she a new character? Yes and no. She’s not new-new, because she debuted in the early 1990s. She was the brainchild of writer Will Murray and was made as a bit of a goof. In a fascinating (well, fascinating if you’re a comics geek) turn of events, she was then drawn in her initial appearance by Steve Ditko, the legendary artist who co-created Spider-Man and Doctor Strange. She puttered around for a few decades, popping up here and there for silly stories but never headlining an ongoing series of her own. What is new is that she now has such a series — The Unbeatable Squirrel Girl — which debuted last year and has become a critical sensation. (We included its latest collection in our list of the best comics volumes of 2016 so far.) She’s bigger than ever now. Has she become some kind of runaway best-seller? Oddly enough, no. Her June issue was ranked 147th in the list of most-ordered comics, moving less than 15,000 copies. The first paperback collection of the series is ranked 114th among superhero trades on Amazon, and didn’t even crack the top 20 for Marvel collections. However, one can imagine at least a little bump from the Hollywood buzz. Okay, so how is she well-known enough to have the attention of two actors in the public eye? She’s got internet appeal, baby. The series is written by longtime webcomics genius Ryan North (the dude behind Dinosaur Comics), who’s very good at reaching out to a certain niche of geeks on Twitter. But more important, the series is just so delightfully odd and nerdy, so filled with Tumblr- and Twitter-friendly phraseology, so well-drawn (penciler Erica Henderson is fantastic and draws Doreen from a decidedly non-male-gaze-y perspective), so filled with comp-sci in-jokes, and so charmingly progressive (without getting in your face about it, it’s pretty feminist) that the character has developed a cult following. The following is hard to measure, but if you check out the “squirrel+girl” tag on Tumblr, you’ll see a lot of what gets people going about her. What are her adventures like? What sets her stories apart from other superhero stories? The Unbeatable Squirrel Girl is bright and fun in a world where far too many comics are dour and weighty. It’s a great read for people who have zero familiarity with other superhero tales, or only know stuff from the Marvel Cinematic Universe movies. It’s dense with jokes and has great little bits of meta-commentary from North at the bottom of most pages. All of that makes it unlike anything else in the superhero vein that one can find on the stands right now. If I wanted to get into Squirrel Girl comics, where do I start? You can’t go wrong with the first volume of The Unbeatable Squirrel Girl, Squirrel Power. You can also read her earlier adventures in a compilation volume. Would a Squirrel Girl movie be any good? That’s hard to say. The current series is deeply entrenched in the comics medium, executing ambitious narrative feats like a choose-your-own-adventure issue and using the aforementioned meta-commentary. It’s hard to imagine Doreen fitting into the Marvel Cinematic Universe, given that her powers are fanciful in a way that makes Ant-Man seem downright rooted in hard physics. It seems like the way to go here might be a totally MCU–unrelated animated film. Okay, but if it did get made, who would make the better Squirrel Girl — Purser or Kendrick? My vote goes to Purser. For one thing, she seems to care (and know) more about the character. 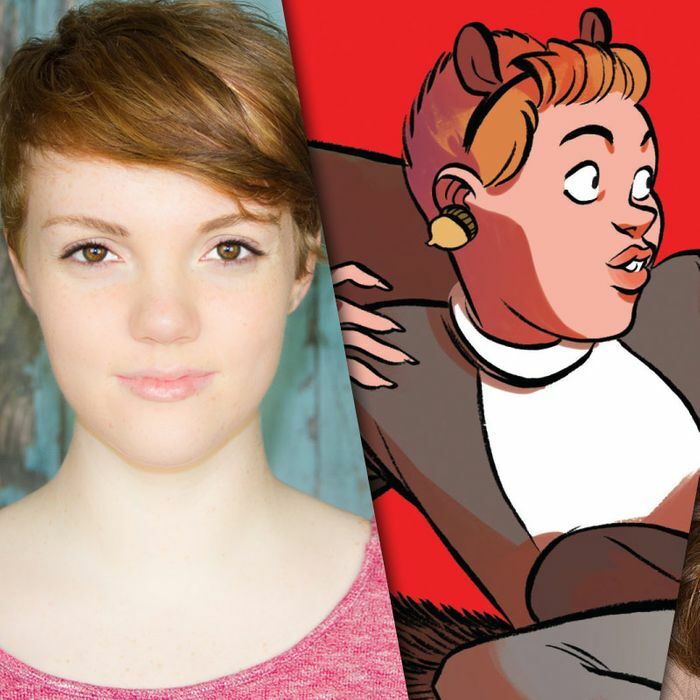 Perhaps most important, we’ve seen Purser play someone awkward, geeky, and visually distinctive in the form of Barb — and those three characteristics are crucial for making Squirrel Girl special in the pantheon of female heroes. Plus, Barb’s already Tumblr-famous; so if Purser got cast, Doreen’s Tumblr fandom would go freaking … nuts. Update: Comedian Lauren Lapkus has now thrown her bushy tail into the ring, too. Who on Earth Is Squirrel Girl?